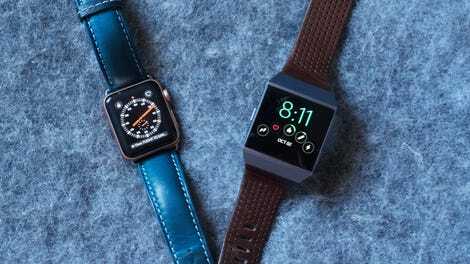 Apple Watch Vs. Fitbit Ionic: What's the Best Smartwatch for You? After years of flailing mediocrity, smartwatches have gotten good enough to be mainstream. Two devices released in the last month, the Apple Watch Series 3 and the Fitbit Ionic, are the best we’ve seen. Not only are they both very, very good at telling time, they’re also capable of myriad other things your Rolex or Timex is not. I’ve worn the wristables for the last two weeks, testing their functions and trying to find and answer to one big question: Which smartwatch is best? If you look at the competitors you’ll immediately notice not a single Android Wear watch made the cut for this comparison. In the past, I’ve been a big fan of what Google is doing on watches, but I also have to acknowledge that Android Wear’s open platform has become mostly a target for fancy legacy fashion brands that want to get into the smartwatch game. The results are for the most part devices that do a good job mimicking the designs of classic watches, whilst not really offering enough functionality to justify the inconveniences inherent in strapping a tiny computer to your wrist. Indeed, the Android Wear platform has notoriously languished, and I can’t in good faith recommend that anybody buy an Android Wear device. So that leaves two big contenders for best smartwatch: The Apple Watch Series 3 and the Fitbit Ionic. The Apple Watch is currently the best selling smartwatch in the world, and unlike any other wearable out there, it’s built from the ground up to work super well with the Apple ecosystem. The latest version, the Series 3, introduces cellular connectivity. That means you can leave the phone at home and take calls over your AirPods (or another paired Bluetooth device). The Fitbit Ionic doesn’t have cellular connectivity (it, like the Apple Watch, does have GPS for tracking your movement during runs or bike rides), but it comes from the former number one company for wearables. Unfortunately, Fitbit’s previous foray in to smartwatches was a total disaster. Yet since buying Kickstarter success story Pebble last year, the hope is that Fitbit can overcome an image problem in the smartwatch space to take on the Apple Watch. To figure out which is best I looked at three primary criteria: How well does each device handle fitness, how good is its battery life, and how many other slick “smart” features are available. One of the main drivers for wearable sales is fitness tracking. People want to track their heart rate, exercise, sleep, and even how often they stand up. Both the Apple Watch and Fitbit Ionic can do all that, and if you’re just casually trying to keep up with how many steps you walk each day, then you can’t go wrong with either. Yet Fitbit has been working on fitness tracking a lot longer than Apple, and it shows in its on-the-watch apps and in its super polished app available for iOS and Android. From left to right: the Apple heart-rate experience versus the Fitbit heart rate experience. Then the Apple Health app experience versus the Fitbit app. Sleep tracking and heart health details are both apparent as soon as you open the app on your phone. Everything you need is found in a single app. The only time you need to change apps when using a Fitbit is if you’ve got a fondness for other popular apps like Strava or Runkeeper. But that’s rare, as the Fitbit app is just that good, and in fact I’d dare say it’s the gold standard for fitness apps integrated with wearables. It’s intuitive, fast, and super informative without ever overloading you with information. Apple, meanwhile, requires at least two apps (Activity and Health) to track the same data—three if you want to drop cash on a sleep tracking app like Sleep Watch. The customization is certainly appealing, and the number of fitness apps that work with the Apple Watch and tie into the primary Health app are staggering. But for a company that preaches simplicity, it also feels counterintuitive. The Apple Watch never quite reaches the same level of excellence for fitness tracking as the Fitbit Ionic. Nowhere is that more obvious than in how each device tracks heart rate. The Apple Watch Series 3 uses a green light-based optical heart rate monitoring system—the kind of system found in older Fitbit products and just about every other heart-rate tracker you wear on your wrist. The Fitbit Ionic uses the same system, but enhances it with red and infrared LEDs. Fitbit claimes that makes it more accurate, and when I compared both watches to a Polar H10 chest monitor (chest monitors use electrodes applied near the heart) I found that to be the case. While the three were within a few beats of each other when I was just sitting around or walking through the neighborhood, the Apple Watch began reporting a higher heart rate the more active I got. At one point the Fitbit and Polar devices said I had heart rate of 115 beats per minute while the Apple Watch said it was closer to 125. That isn’t the end of the world, but when you sum it all up. the Ionic is still the superior device if fitness is your number one priority. But not everyone is out to lose a hundred pounds and get shredded when they buy a watch. A great device needs to be more than a steps counter and a heart-rate tracker. It needs a long-lasting battery and a design that looks good enough that you don’t want to cut off your arm. While I personally find the Ionic deeply unattractive, most people I talked to just assumed it was an Apple Watch. Both devices are big and square (though the 38mm Apple Watch I wore is smaller than the 42.5mm Ionic) and both provide a wide variety of straps. Appearance is not what separates these two in terms of all day wear. Battery life is. Here the Fitbit Ionic handily trounces the Apple Watch. On average, with GPS turned off, I got six days with the Ionic. I left my charger at the office and never once worried about when I’d get a chance to go back and juice up. Because the watch is water resistant I even took it in the shower with me, and ran through a rain storm, and I sweated. A lot. The watch handled it all while still tracking my movements, telling me the time, and shooting me notifications from AP News and my subway tracker app. The Apple Watch, which has cellular service and a whole lot more apps to poll for notifications, lasted only a day on average. Instead of charging it at work once a week I charged it every night on my bedside table as I hopped in the shower (even though it is water resistant). That’s a huge discrepancy between the two, and by the battery results alone the Fitbit Ionic is the superior choice for people who want a reliable device that just lives on their wrist. Okay, so it’s very clear that the Fitbit Ionic is the best device for fitness, and its excellent battery life is a game-changer. Those are two of the most crucial aspects of a smartwatch. But the Fitbit falls short, well, everywhere else. Smartwatches are supposed to improve the way we interact with the digital world and, hopefully, ameliorate our dependence on our phones. Imagine a world in which phones are obsolete, and your main connected devices are a pair of smart glasses or a watch and some wireless earbuds. This is where the Apple Watch Series 3 is miles ahead of the Fitbit Ionic. It’s so good at the “smart” part that some times it doesn’t even feel like a competition. Way more apps on the Apple Watch. The other day I left my phone in my purse and used my Apple Watch to get through security at the airport and get on my flight. Then I texted my roommate about the dog, and fielded a call from my mom that came in over the watch and piped into my earbuds. That’s cool as hell! The Fitbit Ionic with its buggy handful of non-fitness apps and half-baked operating system, simply can’t compare. I’ve had the device over a month and only yesterday got it to check the weather. The Ionic doesn’t even show me notifications for texts, let alone allow me to text other people. It’s a fitness tracker striving to be more, while the Apple Watch is a glimpse of the future. If all you care about is fitness, and you really want a color display for your fitness tracker, then the $300 Fitbit Ionic is the perfect device for you. It lasts for days and is as accurate as a heart rate tracker strapped to your chest. But for me, a gadget nerd who is ready for the Star Trek world right now, the Apple Watch is the best choice. Yes, the fitness tracking still needs improvement, and yes, a day of battery life is deeply annoying—especially when I’m flying back and forth across the country. But this isn’t a battle of the best fitness trackers. It’s a battle of the best smartwatches, and when it comes to smartwatches few have the remarkable brains of the Apple Watch Series 3. If you want to leave the phone at home and move through the world with a computer on your wrist then there’s no competition. The Apple Watch Series 3 is the winner.